This week we are showing you the 10 most popular posts of 2014 on State of Digital. The top 10 is based on a combination of reading numbers, shares and comments. 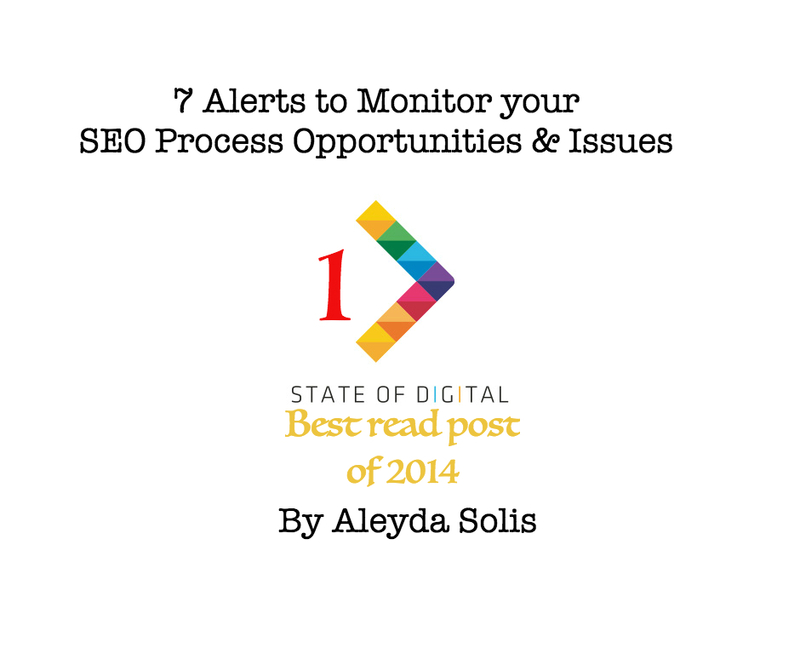 This is number 1!, by Aleyda Solis, about Monitoring SEO! A new SEO project starts. A new set of goals, conversions, KPIs should be set. A new site should be audited. New competitors should be researched. New content created, technical improvements planned and launched. New reports and clients or stakeholders to follow-up with. There’s so much to coordinate and monitor. How to keep easily updated with the most important internal and external issues and opportunities that might arise during the SEO process? It’s time to set your SEO process alerts. Let’s see how to automatize any warnings during the process … for free. When your site is down your online business is closed to your visitors (and search crawlers) and you end-up ultimately losing money. It’s therefore a must that you are informed when this happens. As this is critical, there are already many services out there that focus on monitoring this, although Pingdom and monitor.us are the ones that also offer free options, which might be more suitable to use for smaller sites to receive email alerts when they go down. 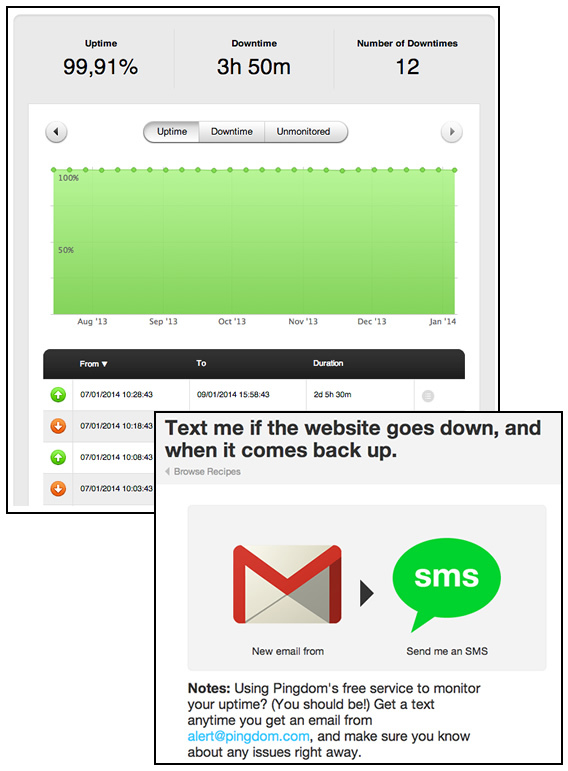 To make the most out of these alerts and keep you updated on the go, you can additionally use this IFTTT recipe for Pingdom to receive an SMS each time your site goes down and comes back up. Monitor your organic search, top categories, most important product pages, mobile, international traffic and your conversions increases and decreases (based on numbers or percentages by day, week or year) by setting Google Analytics custom alerts. You can configure them to receive an email (mobile alerts are only available for the US) each time they are triggered. 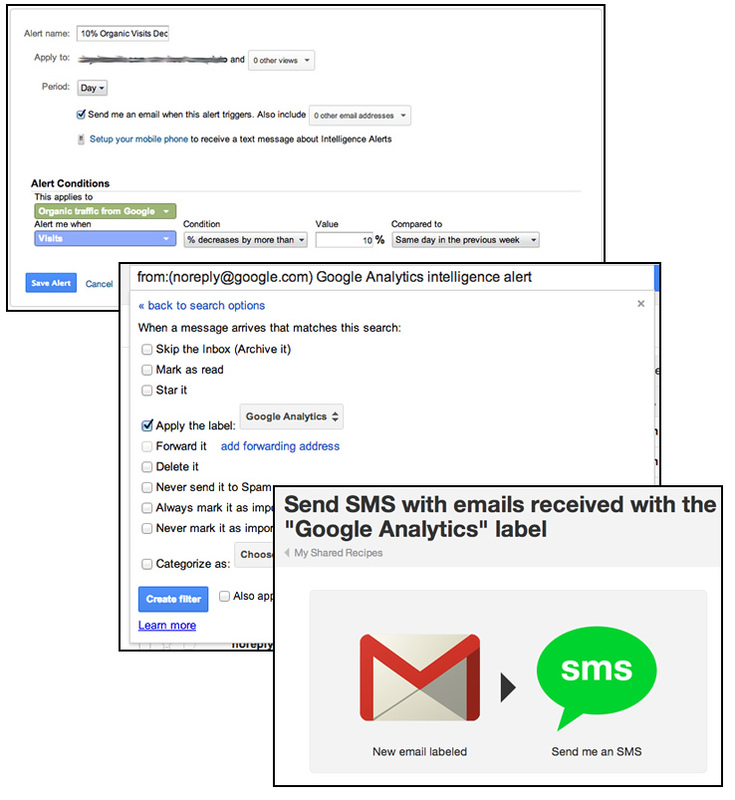 To have these emails sent to you via SMS you can create a label in Gmail and then set a filter to be applied to them (the emails you get from Google with the “Google Analytics intelligence alert” subject). 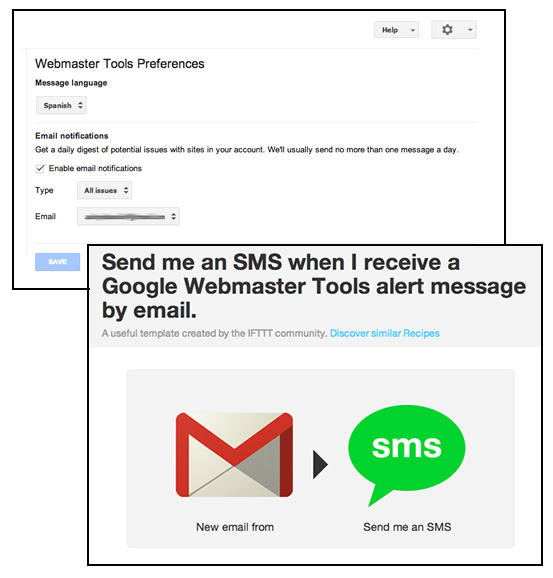 Once you have set the “Google Analytics” label to be automatically applied to these emails you can use this IFTTT recipe to get an SMS each time you receive them. 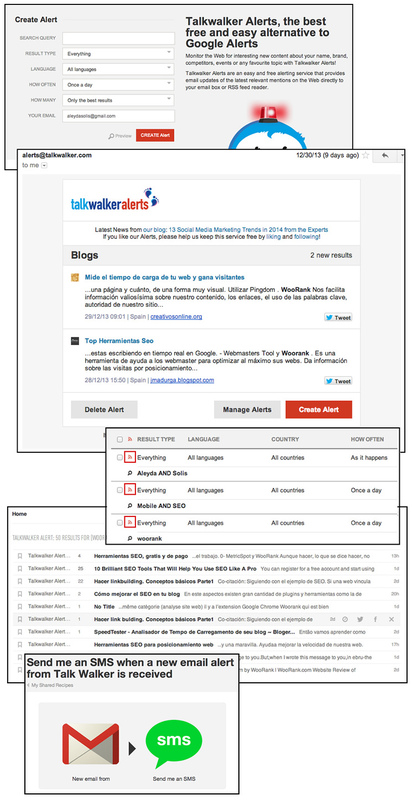 Use Talk Walker or Mention to create alerts for the mentions of your own brand, your competitors and the most important keywords of your SEO process, to easily monitor your online reputation and identify link building opportunities. You can subscribe to them via email or RSS feeds. If you set Talk Walker to receive the emails alerts, you can use this IFTTT recipe to also get SMS alerts warning you about them. 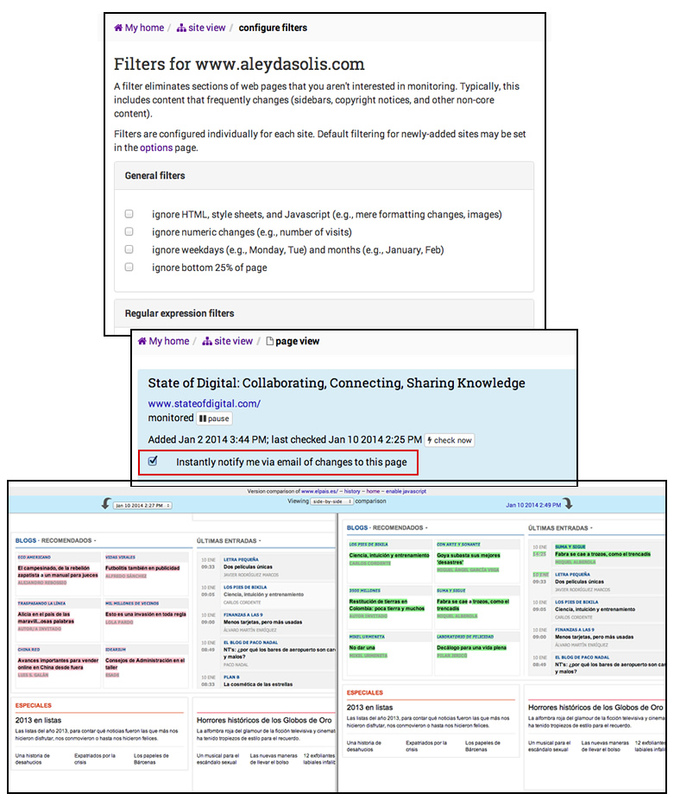 Which are the most important new links that have been built today towards your site? And those of your competitors? Stay updated with your sites and competitors new external links by using the Moz Fresh Web Explorer “rd:” operator to show the links to a root domain and create an email alert for this query. You can create a Gmail label called “Moz Alerts” and use this IFTTT recipe to receive an SMS warning you about these emails. You can also do something similar by using LinkRisk, that allows you to integrate data from Google Webmaster Tools, MajesticSEO, Ahrefs and will send you an email when a new link is detected, for which you can also set an IFTTT recipe to receive an SMS. Use Versionista or Femtoo to follow-up with changes in your own and your competitors top pages: From product or service prices, to titles and descriptions, links or HTML snippets, these services allow you to select the pages key areas that you want to be alerted via email when updated. You can also create and apply a label in Gmail called “Versionista Update Alert” to these emails and receive an SMS alert when you get them by using this IFTTT recipe. 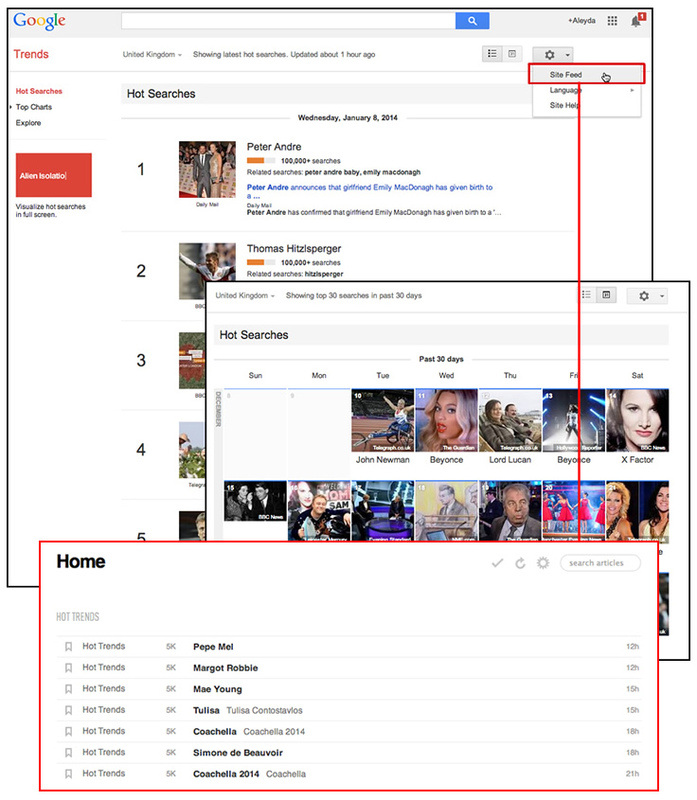 Google Hot Trends allows you to generate an RSS feed (like this one for Hot Trends in the UK) that you can subscribe on with your favorite reader and set an IFTTT SMS recipe, if you want to make sure to not miss anything. Topsy allows you configure email alerts for any search query for which you can also set an IFTTT SMS recipe. As not all of your HARO queries emails will actually contain the desired topics or type of requests you’re interested about, you can additionally set a “Must Read HARO” label for those that contain some specific keywords, configure a filter to be automatically applied to all of those emails that meet the desired criteria and have a warning about them sent via SMS by using this IFTTT recipe for the “Must Read HARO” labelled emails. Last but not least, whenever you register a new site in Google Webmaster Tools you have an email notifications option enabled in the preferences panel, that will allow you to receive by email the messages about your site health, warning about issues from linking to crawling. Nonetheless, sometimes the email address that is set by default is not the one that you actually frequently revise, so it’s important that on one hand you have this option configured with an email address that you use and on the other, if you want to make sure to never ignore these alerts, to use this IFTTT recipe, that will send you an SMS whenever you receive a new Google Webmaster Tools email. Now is your turn! Which other alerts do you set to keep updated when you start an SEO process? 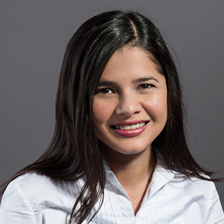 Experienced International SEO Consultant -service that she provides through her company Orainti- and a Moz Associate. She’s a frequent SEO speaker at international conferences & blogger.